" Don't tell lies for a long time and in the eleventh year, whatever you say will turn into reality. " A hugely popular daily horoscope show “Bhavishyavani” hosted by World’s Best Astrologers - Acharya Indu Prakash Broadcasts since 29 MAY, 2007. 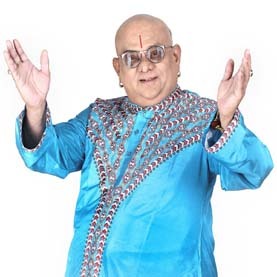 Making a success in Astrology, He made several appearances in numerous religious show, Bollywood Personalities, Social, Legislature life and a lot more. Crowned with a title with MAHAMAHOPADYAYA by the four Shankaracharyas, He completed his graduation from Allahabad University. Making his universal debut through US- based Wall Street Journal Acharya Ji has shaped lives of many. Born and brought up in a Hindu Brahmin Family, he holds a doctorate degree in samudriki, (Astrology, Numerology, Palmistry, Vastu, Sharir Lakshan Vigyan ,Swapn Vichaar ,Dishaa Vigyaan and Vaayu Vigyaan). His Grand Father Shree Gangadhar Misra encouraged him towards Astrology under the guidance of his Guru Swamii Ramlochan Swaroop Brahmachari. Due to his fascination in Astrology, Bhavisyavani gained its admiration till date. Acharya Indu Prakash is deeply related to Maharishi Mahesh Yogi and Acharya Rajnish. He is excessively a dynamic knowledgeable personality in Vedic Gyan of our Holy Saint for 40 years recent. The accurate, flexible, prediction of fortune reveals a lot about his astrology. He has his roots in Jyotish Vidya at a very young age. Acharya ji himself quoted “Crystal gazing isn't negligible estimation; it is a mix of jyotish information and profound cognizance. It's dedication.” Due to his exceptionally easy Vastu Tips, he acquires World’s Best Astrologers place. In simple words, he can be addressed with the corrector of fault in our stars.